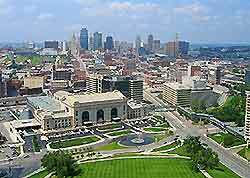 Kansas City is an appealing destination, straddling the state lines of both Missouri and Kansas. With many popular tourist attractions, Kansas City offers a particularly friendly atmosphere, together with many important green areas and spacious living, which combine to give Kansas City a truly unique charm. Kansas City began to thrive during the 1930s and much of its architecture and characters dates from this period. The Kansas City area is also famed for its jazz scene, with live music being plentiful all over the city.